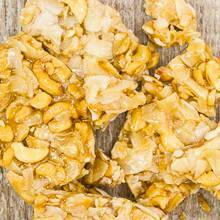 This crunchy brittle offers up the perfect pairing of coconut and cashews. Break it up in small pieces to share with a friend, or turn it into a tasty ice cream topping. Price quoted is per pound, not including shipping.